I saw a post about “Fat, but fit” in a fitness community I follow and I wanted to write up a summary on how the “Healthy at Every Size” community (from which the “Fat, but fit” myth likely spawned from) and why it presents a danger to the fitness community, and the public at large. No, you fat. Stop eating so much. 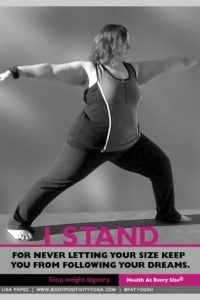 The “Healthy at Every Size” (or “HAES”) community has all the elements of a movement that has good intentions: Promoting awareness that people have feelings and some people don’t like feeling ashamed for being obese, short, deformed, or tall, etc. But what’s wrong with this movement is that it was hijacked by the Identity Politics movement. Some people refer to them as “Social Justice Warriors”. Some call them “special snowflakes”. But no matter what you call them, at the root of the activism has become a circus of mental gymnastics, identity politics, and a victimhood state. It’s also safe to assume that most of you are aware of the meme about how “kids these days” are handed participation trophies and are coddled to avoid having any hurt feelings. There’s some truth to be found in these skin-deep perceptions about today’s youth. Some elements are found in these political activist groups, where as long as you cry victim, other people will listen to you. So if crying victim guarantees to yield an audience, then you’ll find fraudulent victims within activist groups to promote their political agenda. This might be the worst and most harmful elements of these kinds of activist groups, because the victimhood state creates a danger in delegitimizing *real* victims in the eyes of the public, causing real victims (e.g. people who suffer from depression or have an eating disorder, etc) to lose their audience, or causing real victims to feel like they aren’t worthy to seek help because they don’t have dozens of other afflictions or don’t identify a certain way. I’d say, the best way to combat the “Fat, but fit” myth, is to stay diligent in showing people that will, exercise, and diet, are some of the best tools a person can use to get into a more healthy lifestyle, to link to peer-reviewed studies, and to show kindness and respect.